Dirty Dangle Hockey: The Toronto Maple Leafs Are Just The Worst. 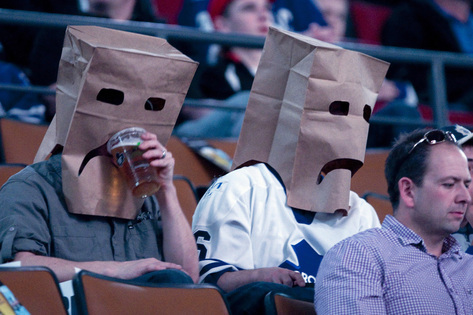 The Toronto Maple Leafs Are Just The Worst. Too bad "drinking beer through a brown bag" wasn't a category. ESPN The Magazine recently released their Ultimate Team Rankings for the four major North American professional sports leagues (NFL, MLB, NBA, NHL) and ranked at the bottom in 122nd place were the Toronto Maple Leafs. They are just the worst according to ESPN. You really shouldn't take the rankings too seriously because the Phoenix Coyotes ranked first in the NHL and 6th overall in North American pro sports. While we don't know enough about the NFL, NBA, or MLB to make any arguments about the rankings as a whole, we can look at the NHL rankings for any flaws in the study. This is a pretty straightforward category and it makes sense to see the Coyotes at the top of the NHL as they've got some of the lowest ticket prices in the league and win plenty of games. At the bottom you have the Leafs; high ticket prices and no postseason games since 2004. Hard to argue this one, you spend your paycheck to go see a game and you usually leave frustrated and spend even more money after at the pub. This category was based on four things: players act professional on and off the ice, players and owners show appreciation to the fans, players accessible to fans, and provide avenue for feedback. Tampa Bay topped the NHL teams, followed closely by the Red Wings and Penguins, whereas the Islanders, Blue Jackets and Leafs rounded out the NHL teams. This is the most subjective category in the study and was weighted to 20.9% of the overall results. Some of these subcategories are hard to define as well - what constitutes accessible for fans? Players on Twitter? Can you walk into the arena on off days? The Leafs aren't too great on the ice, but I would have to say they are professional and accessible to fans. Topping this category were the Detroit Red Wings and the Pittsburgh Penguins, while the Leafs placed 28th ahead of the Blue Jackets and Islanders. The Coyotes, a team that is owned by the NHL, placed just ahead of the Maple Leafs, while numerous teams surrounded by bankruptcy talk the past few years also finished ahead (New Jersey, Dallas). The Leafs finished last in honest ownership and 2nd last in keeping core players and showing loyalty to fans. 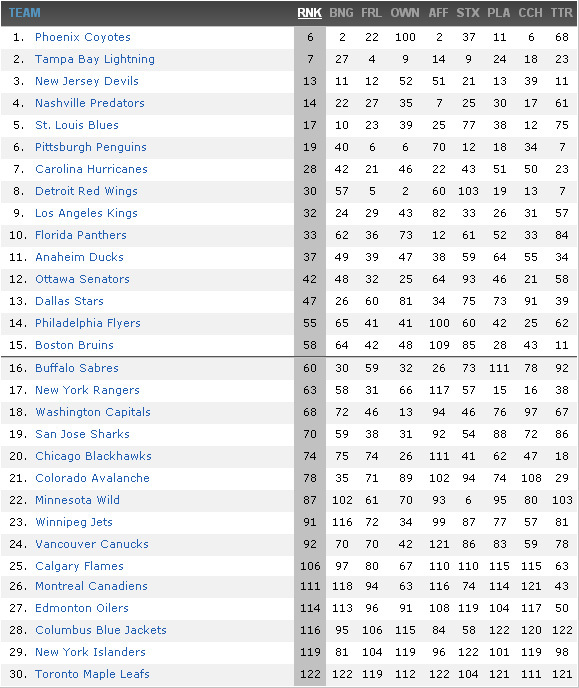 Somehow the Flyers finished 21st despite dumping core players like Richards and Carter last season. The final subcategory was "committed to community and will not leave" and the Leafs ranked 22nd here. Now I know the Leafs do a great deal of charity and community work like other teams (especially with Brian Burke at the helm), but they sure as hell aren't going anywhere. There's a lot of teams with great community relations, but this is the Toronto Maple Leafs - one of the oldest franchises in sport. They should at least be in the top six as they are not going anywhere. There's no arguing that the Leafs are the worst in this category. They finished dead last in the three subcategories of affordable tickets, affordable parking, and affordable concessions in all of North America. With the money you would pay to go see a game you could put your kid through hockey that year. The ticket prices are out of control, but keep being bought. The parking prices are nuts, so just take the TTC, and the concession prices are laughable so just sneak in your own. The Minnesota Wild top the NHL list, whereas the Islanders and Nassau Coliseum finish last in the NHL. The Maple Leafs finished 27th overall. The Leafs and the Air Canada Centre finished 26th in "great stadium" and while I've only been to a handful of other rinks, there is no way that Buffalo's First Niagara Centre should be ranked higher. The Leafs not only finished last in the NHL in "fan promotions, contests and giveaways", but last in the entire study. I don't know if you've been to a Leafs game, but you get bombarded with contests and giveaways to the point you wish they didn't exist. For "fan friendly environment" the Leafs placed 27th, which is a bit surprising because it's usually so quiet in the lower bowls that you can bring your infant child with you to the game to sleep. I can't say for other teams and rinks, but you see a lot of young kids at Leafs games having the time of their lives and you rarely hear of any fights going on, unlike in Montreal. This category was based on "likeable players" and "players always give best effort" which might be the most difficult thing to measure in this entire study. The Coyotes topped this NHL category, whereas the Leafs placed 2nd last in the NHL and the entire survey behind the Blue Jackets who finished dead last. According to this, the Leafs have the least likeable players in all the NFL, MLB, NBA, and NHL. While I scream at them during games, I wouldn't say they're the least likeable. Think of the bullies on the Bruins or the fact that New Orleans Saints players tried to injury opposing players on purpose for bounty money and this doesn't make sense. The Leafs finished behind Columbus for player effort and since there is no way to measure how hard a player is working, I'm not going to use any effort arguing this one. The Coyotes topped this category for on-ice leadership whereas the Montreal Canadiens finished in the NHL basement. 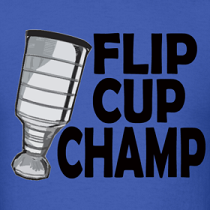 The Maple Leafs placed 25th in the NHL, which isn't bad considering Ron Wilson was the coach for most of the season. Not much to argue here, although strength of on-ice leadership is a little ambiguous and should perhaps include who the leaders on the actual team are under a category of Leadership. This category is based on championships won or expected to win in the lifetime of current fans and the Maple Leafs placed 29th just ahead of Columbus. This means that people expect the Stanley Cup drought in Toronto to last at least another 50 years. While the Leafs are behind many teams in this category, keep in mind they do have some depth and prospects as their farm club made it to the Calder Cup Final last season. Overall, you should take nothing away from these Ultimate Rankings as they are pretty subjective and by the fact that the Phoenix Coyotes are the highest ranked NHL team and 6th overall in North American sports amidst ownership troubles and low attendance they are downright laughable. The Toronto Maple Leafs are bad, but they're not the worst. Pheonix #1? Really, it takes an hour to get to the rink. Ever go to a game in Ottawa? Its so far from downtown, you can't even get a taxi after the game. No bars around the rink, nothing. A serious analysis would have looked at the location of the rink and stadium.